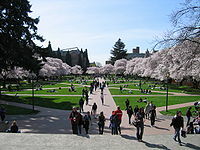 Die Universiteit van Washington (Engels: University of Washington) is 'n universiteit geleë in Seattle, Washington, Verenigde State. Dit is in 1861 gestig. ↑ (en) "The University of Washington's Early Years". No Finer Site: The University of Washington's Early Years On Union Bay. University Libraries. University of Washington. Besoek op April 29, 2015. Wikimedia Commons bevat media in verband met University of Washington. Die bladsy is laas op 6 September 2018 om 17:29 bygewerk.